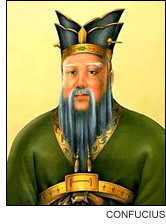 "The fact of One Yin and One Yang is Dao"
Zhou Gong Dan, the younger brother of Zhou Wu Wang, the first king of the Zhou Dynasty, compiled the accumulated wisdom prior to his time (around 1000 B.C.) into a "book" named "Yi" (Changes). 500 years later, Confucius edited the "Book of Yi" and added footnotes on several paragraphs and chapters. His works on "Yi" is later called "Zhou Yi". The texts selected for our studies are from "Zhou Yi" - Zhou's Book of Changes, edited by Confucius. The course will also touch on the area of Divination, the evolution of the 64 occurences derived from the Ba Gua - Octagonal System, but not in detail.